The Carefree Way: Please, no poop! Near the Palace of Fine Arts, in San Francisco, we stumbled upon a flower garden with this sign in it. 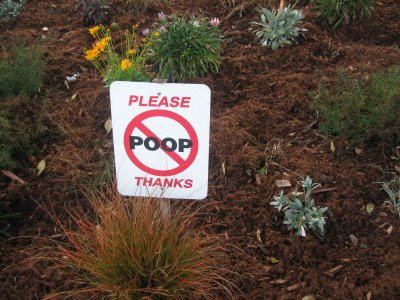 I suppose people walking their dogs might be inclined to try to "help" by dumping the poop in a flower garden. Or they might even let their dogs poop in a garden and not pick it up like they would have to if it was on the street. I don't know. But what I do know is that there's no way having a little dog poop in a flower bed is less attractive than this dumb looking sign. No way. Also, poop = organic. Bacteria, sure, but still organic.